Sharon Kleyne | Bio Logic Aqua Research® Technologies International, Inc. The Result of Two Decades of Research into the Health Effects of Water, Pollution, Climate Change and Air. Sharon Kleyne, an American woman, business entrepreneur, water advocate and Founder of Bio-Logic Aqua Research, is announcing a series of breakthrough discoveries by her company that are creating a new branded category in the business of water – “water mixed with air” (which has very different properties and benefits than liquid water). She projects that this new category water business will achieve global distribution, with billion-dollar a year sales. This new category business is expected to greatly expand the existing global business of water, already growing rapidly, that is currently dominated by water-to-drink. Two decades ago, Mrs. Kleyne founded Bio-Logic Aqua Research in Grants Pass, Oregon, out of concern for the combined health effects of water, pollution, climate change and air. Mrs. Kleyne challenged herself to develop an effective individual, all-natural, all-water, hand-held portable humidifying device for dry skin and dry eyes, to generate global mass market sales. That challenge has now been met – due to breakthrough discoveries by Bio-Logic Aqua Research involving the utilization of humidity from the air by the skin and eyes, the ideal water for maximum beneficial surface absorption, and the technology of mist application. Bio-Logic Aqua Research is the only company, worldwide, whose exclusive business is the bottling and marketing of an all-natural trade secret water as an all-natural humidity supplement, for external application to the human body. Dry air, Mrs. Kleyne discovered, causes numerous dehydration diseases such as dry skin, dry eyes, allergies and melanoma. Environmentally caused dry eye is now the #1 reason for eye doctor visits in the United States. In countries with extreme air pollution and/or water shortages, dry eye has become a major health crisis. Ninety-percent of the world’s blind live in places such as China, India and areas of Africa, and the blindness rate is expected to double by 2030. After assembling a global Business and Medical Advisory Team to participate in this new discovery, Mrs. Kleyne conducted research, consulted with scientists, doctors, business leaders and Wall Street, and developed a business plan that remains the road map to the company’s future. The ideal water for application as an airborne mist to dehydrated skin and eyes, it was discovered, is the company’s trademarked, trade secret water, “Bio-Logic Aqua® all-natural tissue culture grade water.” Double-blind testing shows that the water is ideal for maximum beneficial absorption into dry skin and dry eyes, with no burning or blurring. Bio-Logic Aqua Research invested millions of dollars into researching the properties, application and benefits of Bio-Logic Aqua water. The company then invested in market research and testing of its products in 70,000 retail outlets (chain and independent drugstores, doctors’ offices, high end department stories, hospitals, the military, law enforcement, etc. ), generating millions of dollars in sales. It also obtained the first United States Patent on the application of a pure mist to humidify dry eyes and a dry tear film. The company holds patents or pending patents in several countries. Bio-Logic Aqua Research markets three hand-held water mist products, for dry eye, dry skin, and first aid and emergencies, with additional products in development. Sunshine is a wonderful thing. In plants, it stimulates green chlorophyll to produce free oxygen, enabling us to breathe. Sunshine invigorates, energizes and causes the skin to produce Vitamin D, the “Sunshine Vitamin.” Of course, sunshine can also give you a painful sunburn. The primary “bad factor” in sunlight is ultraviolet (UV) light. UV is the component of sunlight that causes skin dehydration, sunburn, collagen damage, DNA damage and skin cancers such as melanoma. Education about UV light, combined with a few simple skin care precautions, can significantly affect skin (and eye) health. Ultraviolet light is light with a wavelength just a little too short to fall within the visible spectrum (100 to 400 nanometers). Compare this to infrared light, which has a wavelength just a little too long to fall within in visible spectrum (700 to 3,000 nanometers). Earth’s ozone layer filters out 98% of UV rays. Of the UV radiation that gets through, 98% is Ultraviolet-A (UVA). (UVA) has a wavelength of 400 to 315 nanometers (visible violet light has a wavelength of 400 to 500 nanometers). UVA does not cause sunburn but can cause skin drying, collagen damage and rapid aging. UVB has a wavelength of 315 to 280 nanometers. UVB causes sunburn and DNA damage that can lead to skin cancers such as melanoma. On the positive side, UVB stimulates the production of Vitamin D and melanin (melanin helps block UV rays). UVC has a wavelength of 280 to 100 nanometers and is used to kill bacteria. UVC can be extremely damaging to skin. You are most likely to encounter UVC at high elevations and in ozone depleted areas such as Antarctica. Well hydrated skin, containing adequate water, is more resistant to the harmful effects of UVA and UVB than dehydrated skin (dry skin), with not enough water. Dry air, air pollution, forced-air heating and cooling and insulated walls and windows also contribute to dry skin. Sunscreen, which blocks UV light, is recommended for facial skin anytime you go outside in sunlight, no matter what the season. Sunscreen is most effective if the skin underneath is well hydrated. In addition to blocking UV rays, the lotion in sunscreen acts as a sealer to help the skin retain water. The darker your skin, the higher the melanin component, the more resistant your skin is to UV rays. As a sunburn heals, it temporarily stimulates melanin production (tanning). Natural fabrics with a tight weave are effective in blocking UV rays. As with sunscreens, different fabrics and weaves have specific SPFs (solar protection factors). A hat, sunglasses and long sleeves also offer important UV protection in sunlight. To make sure your skin (and eyes) contain adequate moisture, drink at least eight glasses of pure water (in addition to coffee, tea, soda or juice) per day. Also, bathe often, keep your windows open when possible. 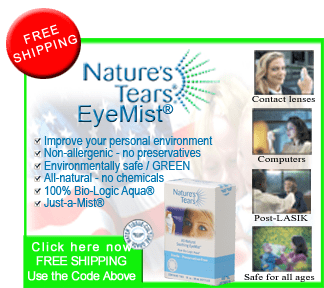 Finally, for dry skin and dry eyes, get into a daily habit of frequent facial and eye misting with Nature’s Tears EyeMist or Nature’s Mist Face of the Water, hand-held water therapy devices from Bio-Logic Aqua Research. You are currently browsing the archives for the Sharon Kleyne category.